Plastics are ubiquitous in the modern world. Consider how many plastics we touch in a single day, whether it be a toothbrush, a coffee lid, or a smartphone. It is difficult for us to avoid plastics, and our plastic production and consumption habits have important consequences for our planet’s wildlife. In the marine environment, plastic pollution is a growing global problem. Avoiding plastics is becoming just as difficult for marine life as it is for us! In my work with leatherback sea turtles, I’ve been up close and personal with the impacts of plastic on this endangered species. 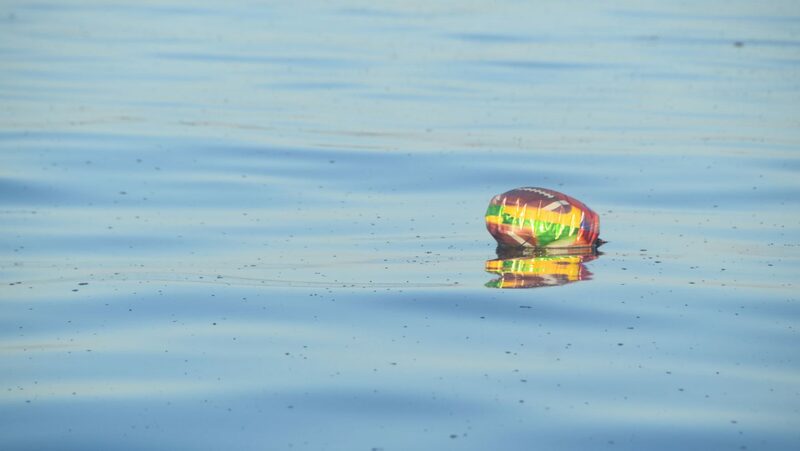 We routinely encounter plastics during our fieldwork, especially in important feeding areas where water currents will concentrate the turtles’ food (sea jellies) along with floating debris. We’ve seen an incredible variety of plastic waste, including balloons, food wrappers, beach toys, flip-flops, grocery bags, and ever-present water and soda bottles. Undoubtedly, there are also “micro-plastics” that are too tiny for us to see. Mylar balloon in leatherback turtle feeding grounds. Photo credit: Kara Dodge. 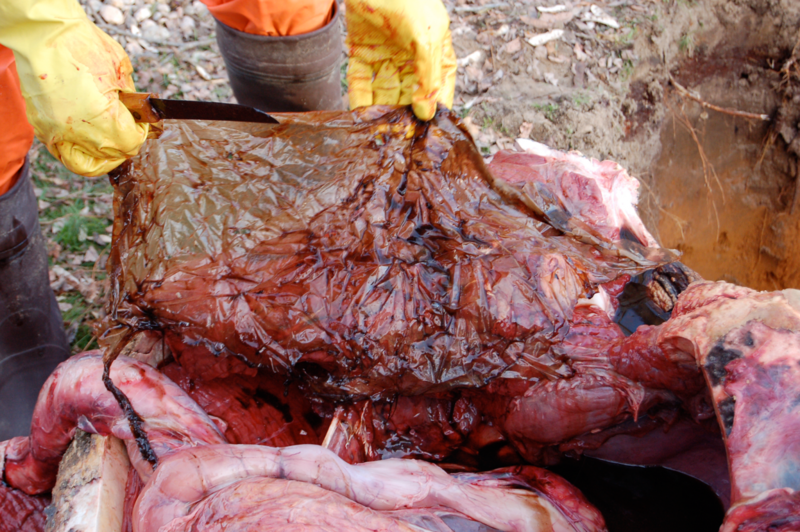 Leatherback turtles feeding in this contaminated “soup” are very likely to ingest some of these plastics. 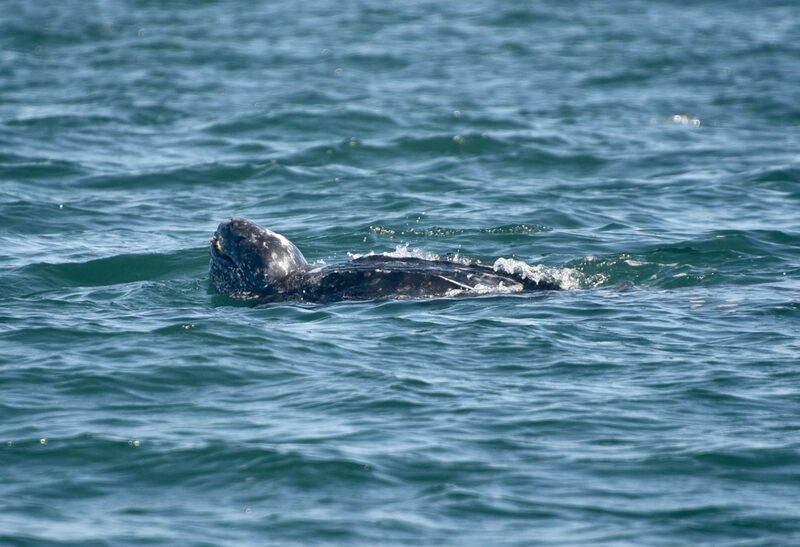 As part of the TurtleCam project, a collaboration with Woods Hole Oceanographic Institution, we filmed leatherback turtles eating hundreds of sea jellies that bear a remarkable resemblance to single-use plastic shopping bags. These turtles feed continuously and are not equipped to regurgitate plastics if they make a mistake. And it would be easy to make a mistake – these turtles are visual predators and their feeding areas off Massachusetts are usually murky with poor visibility. Leatherback Sea Turtle Feeding on Jellies. A leatherback turtle feeds on Atlantic sea nettle jellies off Cape Cod, Massachusetts. NMFS Permit #15672. TurtleCam is a collaborative project between the Woods Hole Oceanographic Institution (WHOI) and the New England Aquarium’s Anderson Cabot Center for Ocean Life. Video by Amy Kukulya, WHOI. I don’t think I could tell the difference between plastic bags and sea jellies in these conditions, and turtles aren’t thinking about what to avoid. They’re just doing what they’ve been doing for over 100 million years, well before plastic entered their environment. Feeding leatherback turtle. Photo credit: Kara Dodge, NMFS Permit #15672. When it comes to plastics, we can take steps to reduce our impact on sea turtles and other wildlife starting with our consumption habits. On an individual level, we can say no to avoidable single-use plastics (cups, utensils, straws, take-out containers, bags, packaging) in our daily lives and push local businesses to offer better alternatives. At a higher level, we need to advocate for change in the plastics industry that results in less virgin plastic production and greater reuse and recycling of existing plastics. Our choices and voices matter! The New England Aquarium is joining with more than 20 other aquariums across the country because there are simple actions we can all take in a stand against single-use plastics. The nationwide campaign, called The First Step, offers suggestions on how we can make a difference—individually and as a nationwide community that cares about our blue planet. If you don’t need that plastic straw, skip it.